Green TerraMesh® is an environmentally friendly modular system used for soil reinforcement, such as mechanically stabilized earth slopes and embankments. 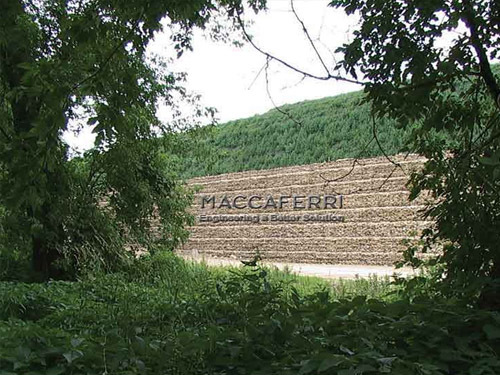 Maccaferri Green Terramesh® incorporates an innovative formwork system that creates a “green” faced reinforced earth retaining wall in conjunction with polyester geogrids and compacted back fill. Maccaferri Green Terramesh® units have a factory fitted, biodegradable facing layer which retains a 300 mm layer of good quality topsoil to act as a nutrient reservoir. Green Terramesh® is a completely assembled unit made of double twist heavily galvanized and PVC coated wire mesh lined with BioMac® and strengthened with a welded steel panel. No external support or shuttering is required when installing Green Terramesh®, decreasing considerably the installation time. A steel reinforcement mesh is factory assembled to provide rigidity to the faces. The steepest slope we recommend is 70° from the horizontal as it is difficult to successfully establish vegetation beyond this angle. Soil bioengineering techniques, like live staking and brush layering, can be used to create a more natural look to the structure.